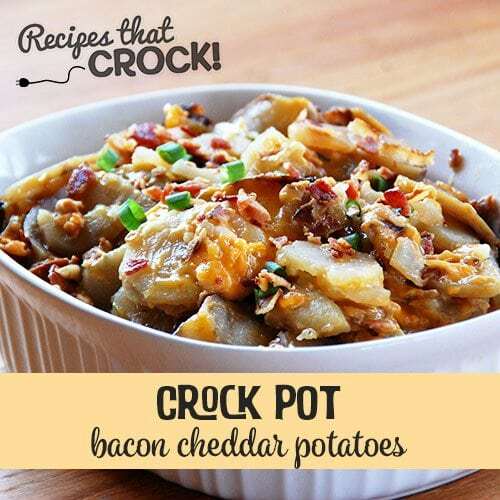 Bacon Cheddar Crock Pot Potatoes - Recipes That Crock! Do you love a good bacon cheddar baked potato? Then you will love this Bacon Cheddar Crock Pot Potatoes recipe from Gooseberry Patch’s Slow-Cooker Christmas Favorites. They are absolutely delicious! UPDATED: This recipe was voted a battle winner by our YouTube community so we made a cooking video. After the mean ol’ onions were sliced, I just layered it up. Another great thing about this recipe is that the cleanup is easy peasy since you use aluminum foil! Delicious Bacon Cheddar Potatoes that are easy to throw together! A half hour before serving, add your shredded cheese and stir gently. Since we were going to be going to Mom and Dad’s, I used my Travel Crock Pot. I love that I can secure the lid and have worry free traveling! Your favorite 5-6 quart slow cooker would work just fine too! How about some fineli diced garlic in there as well? 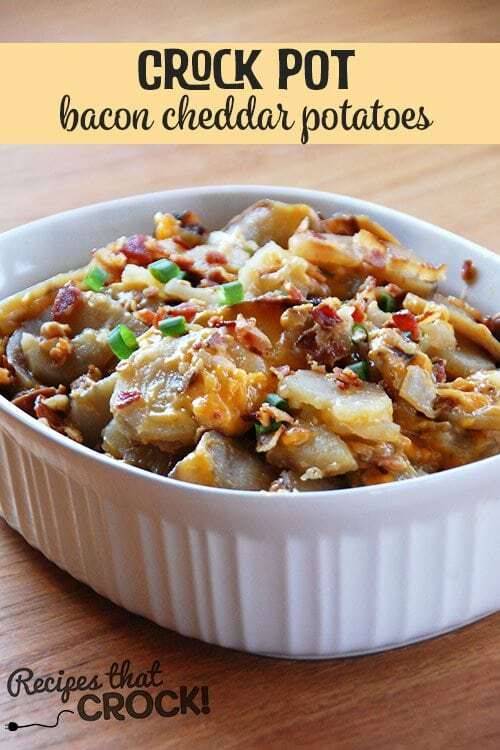 I have never tried that, but Garlic Bacon Cheddar Potatoes sound great to me! Let me know what you think when you give it a try! Enjoy! Now I’m wondering what brand is your food processor? I recently found one at the goodwill for $4. But it did not have the slicer or shredder with it. We have this 14 Cup Cuisinart (referral) http://amzn.to/2nDPQZ0. However, I am sure you can probably find a less expensive model with a slicer or shredder. You could maybe even buy those accessories from the manufacturer or even on amazon by searching the model number. Hope that helps! Do you cook the potatoes beforehand??? Nope! 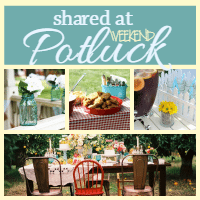 Everything cooks together in your crock pot to blend the flavors beautifully! Enjoy! Hi.. This recipe sounds really yummy! Although I’m a bit confused, do you bake it please? And cook for 4-6 hours?? Thank you! You cook it in your crock pot for 4-6 hours, not your oven. Enjoy! what kind of potatoes to use? And will the Bacon stay crispy? I used russet potatoes. The bacon stays pretty crispy. If you would like some extra crunch, you can reserve some and sprinkle on the top at the end. Potatoes, bacon and cheese…what more could you ask for?!!! Can’t wait to try this! My mother used to say that holding an unstruck wooden match between your teeth would keep the tears away. Can I make this in a 4 quart slow cooker? I haven’t cooked it in a 4 quart, but you could give it a try. This filled up a little over half of my 6 quart, so it would probably fit. It may take more time to cook though because it won’t be as spread out. So make sure you watch it closely the first time you make it in a 4 quart. Enjoy! This looks great! How many servings does this make? I’m hosting a dinner Saturday night for a family of 6 plus my family of 5. Thanks! My Grandmother told me to keep my onions in the refrigerator till I used them, cuts down on the tearing and they last longer out of the heat. I’ve been doing it for all my year of cooking and never a tear shed!! Hope it works for you! Thanks for the tip Ruthie! I had never heard of this. My onions are now in the fridge. Fingers crossed! by the shredded cheddar cheese it has 3 c….what does the “c” stand for? Hi Steve! 3 Cups. Enjoy! Bacon, cheese and potatoes= my favorite foods. What”s not to love? Will mAke these the next time I have my daughter and son-in-law over for supper. I’ve heard holding a slice of bread in your mouth while cutting etc onions keeps you from tearing up. I have never heard that before! I am doing some recipes tonight that have onion in them and will have to try it out. Thanks for the tip! I haven’t tried it, but if you like cooked green onion, I don’t see why not! Enjoy!